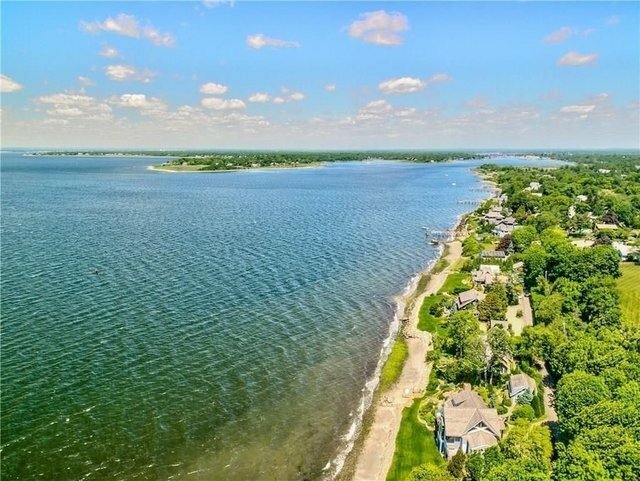 Private waterfront compound, with 600 feet of coastline, beautifully sited on the western shore of Narragansett Bay down a private lane in Bristol Highlands. The four properties (#'s 73,79,85,91) offer every amenity and sunset views for the discriminating buyer.The main house consists of an expansive Great Room, Dining Room with fireplace, gourmet kitchen, butler's pantry, and three bedrooms with 2+ baths. An additional structure on the site includes a staff apartment, office and laundry facilities. A guest cottage offers 2,000 square feet of living space-a spacious Great Room with soaring ceilings and fireplace, kitchen, master bedroom w/fireplace, 2 master baths, office/dressing room and powder room.The main and guest house are arranged around a stunning infinity edge pool and spa, with ample outdoor seating. A cabana completes the pool area and includes a sauna, full bath, and bar.There is a newly built, sensational Tea House with guest suite, open pavilion with soaring wood ceilings and a Zen-style dining table. The Tea House also includes a tropical green house, two half baths, and a two-car garage.Completing the compound is the contemporary "Glass House" for larger scale entertaining. Walls of glass bring the outdoors into the Great Room and sleek and elegant kitchen with fireplace. The kitchen opens to a deck with fireplace overlooking the bay and a koi pond/waterfall. The Glass House offers 2-3 bedrooms, 2.5 baths, another attached greenhouse, and one-car garage with loft studio.The landscape, professionally designed, compliments the seaside location.